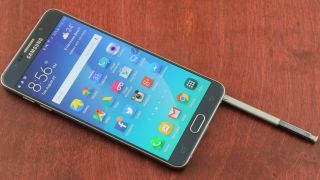 If you've read our review you'll know we're big fans of the Samsung Galaxy Note 5. Yet if you live in Europe reading our review while crying into your coffee is all you can do, as strangely the phone wasn't released in this part of the world. But that might all be about to change, as according to gadget-talk (a Romanian tech blog) the phone could arrive here as soon as January. The blog says this was confirmed by a source 'close to Samsung Romania', but with no evidence backing the claim up we remain wary. Still, we can't see that it makes sense for Samsung to deprive a big chunk of the world of one of its best and most popular handsets, so we want to believe the Note 5 is coming. If it does then there's an outside chance that you won't even have to wait until January, as the same site theorises that the Galaxy Note 5 could land in December to take advantage of Christmas sales. So one way or another hopefully we'll see it soon and until then there's always the curvy Samsung Galaxy S6 Edge+ to fulfil your Samsung phablet cravings. The Samsung Galaxy Note 4 is still a great option.